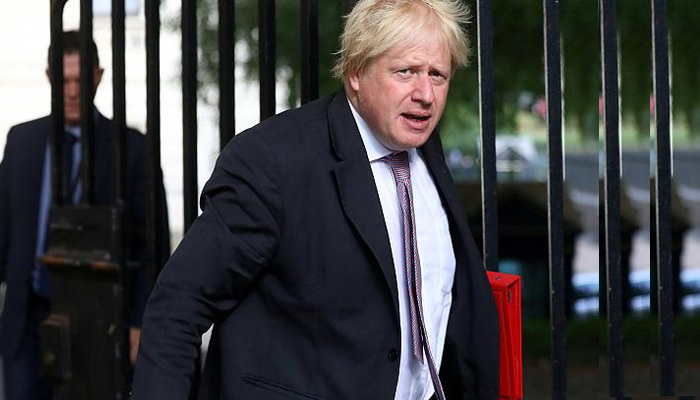 LONDON: Former British foreign minister Boris Johnson returned from his summer holiday to face both criticism and support over his remarks about burqas, amid deepening divisions in Britain´s ruling Conservative Party on Sunday. Johnson, seen as the biggest threat to Prime Minister Theresa May´s struggling leadership, has become a lightning rod for discontent within the party after a newspaper column in which he said Muslim women who wear burqas look like letter boxes or bank robbers. The comments came in a piece arguing against a ban on the Islamic full-face veil, but have been criticised as Islamophobic. Others saw the remarks as colourful rhetoric that strikes a chord with many Britons. May has scolded Johnson, stirring anger amongst those of his supporters who see him as the focal point for resistance to her proposed "business-friendly" Brexit plan. The party has also launched an investigation into his remarks. Under the headline "Boris sparks cabinet war" the Sunday Times said four unnamed senior ministers were dismayed at May´s handling of the situation. "They have managed to engineer a total disaster," one minister was quoted as saying. "Trying to silence Boris is stupid, especially when the majority of people agree with him. "Johnson spent Sunday at his residence in the small town of Thame, around 80 km (50 miles) northwest of London, emerging only to bring cups of tea to reporters. Asked whether he regretted his comments, he declined to comment. Johnson resigned from the cabinet last month in protest at May´s Brexit plan, setting himself up as a talisman for the many Conservatives who want a more radical departure from the European Union. Meanwhile, May has struggled to hold her cabinet together on Brexit and faces a testing few months in which she hopes to secure a deal on leaving the EU, face the party´s unhappy grassroots, and win a crucial vote in parliament. Johnson´s burqa remarks were defended by, amongst others, Donald Trump´s former political strategist Steve Bannon, who told the Sunday Times that his overall message had been lost because of a "throwaway line". Bannon has previously called on Johnson to challenge May´s leadership. But a Conservative member of the upper house of parliament and former government polling adviser, Andrew Cooper, accused Johnson of "moral emptiness" and populism over the remarks. "The rottenness of Boris Johnson goes deeper even than his casual racism & his equally casual courting of fascism. He will advocate literally anything to play to the crowd of the moment," Cooper said on Twitter. Johnson, who has made clear that he does not intend to apologise, returned to Britain on Saturday. His is expected to break his silence in his regular column, due to be published by the Telegraph newspaper late on Sunday.